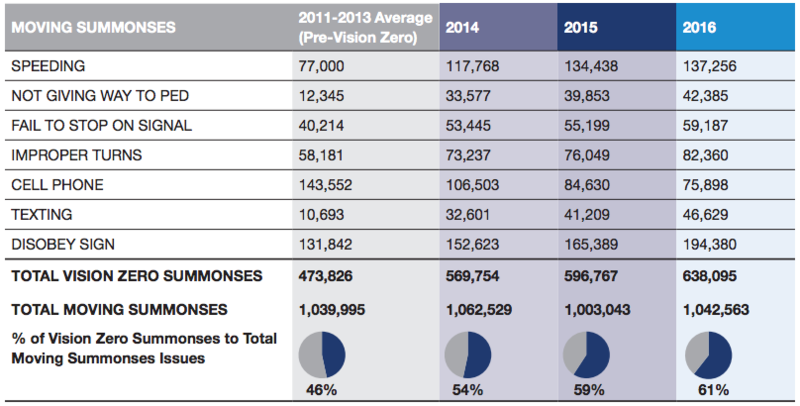 Earlier today, the mayor’s office released its “Vision Zero Year Three Report,” an 82-page self-assessment of City Hall’s efforts to eliminate traffic deaths by 2024. 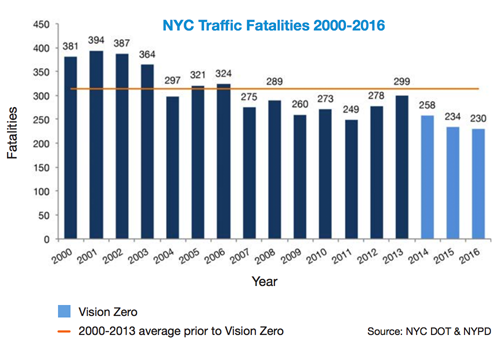 The de Blasio administration has reduced fatalities every year — the first time in more than a decade the city has had a streak of three years with declining traffic deaths. But the pace of improvement leveled off in 2016, highlighting how much work remains to reach the Vision Zero target. 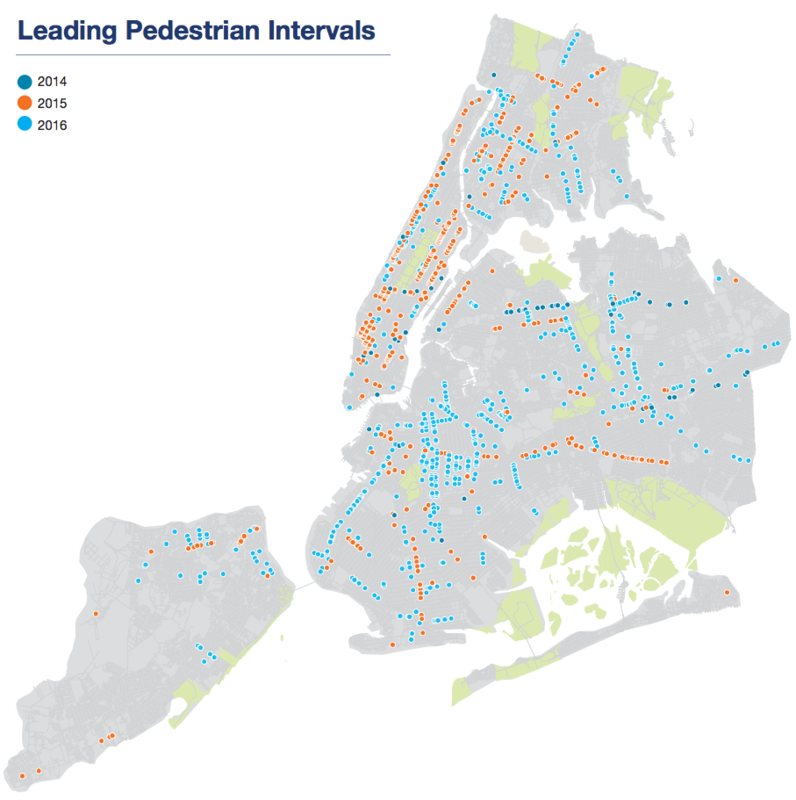 The initiatives in the report — like DOT’s 18 miles of protected bike lanes and pilot program for raised crosswalks — aren’t news, but the visualizations help convey exactly what the city is doing to improve street safety. Another area where DOT has made rapid progress: intersection improvements to make left turns safer, which have been installed at 107 locations since August. Transportation Alternatives’ Research and Policy Manager Julia Kite attributed the quick action to a “data-driven approach” that identified dangerous intersections where cost-effective interventions could have an impact. “The fact that [DOT was] able to roll those out in one year really gives faith that it’s something we can see spread across the city,” she said. 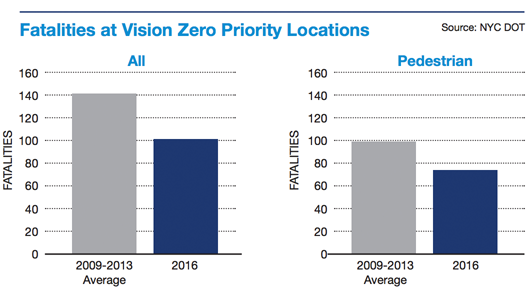 The report also illustrates how NYPD has shifted its enforcement priorities to emphasize six “Vision Zero violations” — speeding, failure-to-yield, failure to stop at a traffic signal, illegal turns, using a cell phone, and disobeying street signs. Those offenses accounted for 61 percent of total moving violations last year, compared to 46 percent in the three years preceding the launch of Vision Zero. Nevertheless, total traffic fatalities didn’t change much last year, and pedestrian and cyclist fatalities increased. The city will need to take bolder action and not shy away from transformative changes, Kite said, in order to make a substantial dent in the number of traffic fatalities. Man, they could make a killing on drivers running red lights if they applied themselves! estimates that as many as 40,000 people died in motor vehicle crashes in 2016.
most dramatic two-year escalation in 53 years.” ? Or illegal turns or illegal u-turns at basically any intersection. Or people who stop ahead of the stop line and even in the crosswalk; or people who violate alternate side parking rules. Just today I saw a street sweeper have to constantly go around cars parked where they didn’t belong on Meserole Street in Brooklyn. There should be a tow truck that follows ever street sweeper in order to take away every car that is parked on the wrong side of the street. That describes every Monday and Tuesday on my block to a T. Such a simple concept, so hard for entitled drivers to manage. Very good point. The nationwide trend can be attributed to increased vehicle miles traveled as a result of lower gas prices. In NYC, however, it would seem that vehicle travel is less dependent on fluctuations in gas prices. In fact, a report I saw indicated that there’s been a decline in the number of cars entering the city over the past few years. Possibly because of the influx of for hire (Uber/Lift) vehicles which enter the city only once, but roam the city all day creating congestion and slowing traffic which may deter other drivers from driving into the city.